Well here we are only 6 days until Wrestlemania “Play Button” (31) in San Francisco, CA. The build up to this Wrestlemania seems a little lackluster, based on my feelings towards going into it. I have been away from watching wrestling full time for about 10 years. But now we, at Nerd Management, are neck deep in it. Based on what the IWC’s reactions are, and from what I have seen from the past couple of Wrestlemanias on the WWE Network the build up just isn’t there this year. We have had an absentee Champion, a former star who unfortunately has fallen out of favor with the IWC, the biggest star right now was hurt for 8 months and came back to lead the Mid-Cards, a nobody with an amazing gimmick that got buried for going “Over” with the fans, and an Icon coming back to only 6 appearances on a contract. Also we haven’t seen the Undertaker in a year, and his opponent; who is arguably the greatest promo man the Wrestling World has every had, is carrying a feud by himself and doing a masterful job of it. So the Raw Go Home Show kicks off with Sting coming to the ring and talking about kicking off a Raw. He faulters a couple of times on the mic but hey he wasn’t the worst of the night. Stephanie McMahon comes out and as always lights up the mic with amazing accuracy. The idiot crowd started in on her with the “What” Chants and instead of phasing her, she spoke faster and didn’t give them a chance to “What” her and the crowd’s momentum died. That is how you kill a “What” chant. She tries to slap Sting and HHH comes out to confront him. After this is kind of faltered, there wasn’t any real feel that they were going to face off. A tag team match between R-Truth and Dean Ambrose v. Luke Harper and Stardust was next with Bad News Barrett on commentary. Good wrestling, some good spots, but over all the match was overshadowed by Bad News Barrett arguing with Booker T and JBL on commentary. If that was the point then amazing job, but it was a total distraction from what was going on in the ring. The 4 guys in the ring were unable to tell a story, and my only theory has to be because the IC Title Ladder match at WM is not about them or BNB. It is about Dolf Ziggler and Daniel Bryan who have a match later in the show. With Barrett’s distracting commentary and no one paying attention to the wrestlers in the ring, Bryan v. Ziggler at Wrestlemania in the Ladder match will Steal the Show at Wrestlemania 31. A 10 man Tag Team match between entrants from the Andre the Giant Memorial Battle Royal was next and we had Bill Simmons from ABC/ESPN as a guest commentator. The match was Erik Rowan, The Ryback, Zack Ryder, and Pryme Tyme Playahs v. The Ascension, Adam Rose, Miz, and Mizdow. But the star of the match was Bill Simmons for being great. He called out the WWE for making it hard to make an Andre the Giant 30 for 30, he asked were the Bunny was, he said JBL put Cena “over” at Wrestlemania 21, he build Brock Lesnar up as a monster attraction. By far he was the best guest commentator they’ve had in a long time. Next was RKO v. J&J Security w/ Seth Rollins, this was a lackluster build and kind of boring. It seemed like a time filler, with 2 of the biggest stars in the business as the pieces. One of the Matches of the Night came next, and it was a Freaking Divas match! Nikki Bella v. Paige for the Divas Championship lasted over 10 minuets of in-ring time. It had great wrestling, good back and forth taunts by both Women, a #SUPERCENA moment for Nikki, a swerve, and a betrayal. With time like this in a match, if all of the Divas on the roster could put up this kind of intensity the division would really grow and finally get the respect that it seems to this it deserves. This was the first time I have cared about watching the Divas match instead of Fast Forwarding since I came back to watching wrestling. Natty with Cesaro and Kidd v. Los Matadores with El Torrito with the Usos were next and again, it seems like it was just a time sponge. Nothing exiting happened in this match to make me excited for the “Dark Match” at Wrestlemania 31. Rusev v. Swagger in a squash match was next but then the unexpected happened… wait the completely expected happened. Cena came out and gets decimated by Rusev, I mean utterly and completely destroyed by Rusev. Like Orton v. Rollins bad… Why did they do this you ask? #LOLCENAWINS strikes again. The same thing happens to Cena all of the time, and the same thing happened last year by Bray Wyatt before Wrestlemania 30. Cena overcomes the odds as Mania to become the US Champion. It is by far the worst kept secret on this show. But as long as its entertaining and Cena can bring the US Title back to goof standing I am actually ok this time. I don’t think it will bury Rusev, Bray seems just fine. Bray Wyatt comes out and cuts one of the most intense promos I have ever seen. It was masterful and great. He is single-handedly carrying this 1 sided feud and it will be amazing for the payoff. Win or Lose I can see Bray being huge at Wrestlemania and after. Ziggler v. Bryan with Dean Ambrose as Special Guest Referee was my co-match of the night with the Divas match. And once again great wrestling displayed by the 2 best technicians on the roster. This IC Title Ladder Match at Wrestlemania 31 will indeed steal the show. But unlike the Cena v. Rusev match. I don’t think there is a clear cut winner right now. I mean Ziggler has beaten Bryan clean twice. The Man who a year ago won the World Championship at Wrestlemania 30 has been beaten by Dolf Ziggler on Raw and Smackdown. The Dean Ambrose lays out Ziggler and Bad News Barrett cleans house as well. I know from the bottom of my fandom, this is absolutely the best match of this years Wrestlemania card. An amazing promo by the man called Paul Heyman; introducing the Beast Incarnate Brock Lesnar. The reigning, defending, undisputed Heavyweight Champion of the WWE; the 1 in 21-1, and slayer of men comes in behind Heyman into the ring and stands there mighty. Then Roman comes down through the audience like Rod Roddy just called his name on the Price is Right and got into the ring and stared down Brock Lesnar. They had an exchange of words and then THIS HAPPENED. Are you kidding me WWE? Seriously you end a great “Go Home Show” like this? What are you thinking? SMH I guess we will have to find out this Sunday 3/29/15 on the WWE Network at 7pm when Wrestlemania 31 starts. Winners will be announced June 2 2014!!! We will be announcing a GIVEAWAY CONTEST very soon coinciding with our Indy Pop Con appearance this Friday Saturday and Sunday!!! X-Men: Days of Future Past 10/10 GO SEE IT!!! Going into this movie, with all of the hype and hoopla being made over it; and even the Hardee’s ads featuring some of the cast, I still had high hopes. That sometimes is a scary thing to do; going into a large budget movie with high hopes makes you feel a bit like Icarus. But I will tell you what, these wax wings held up! This movie starts off intense and continues to hold you until don’t even realize that you just set through 2 hours and 15 minutes of the Best X-Men Movie EVER! Yep, better than X2! The movie started off in a fight sequence with some new characters mixed in with some old favorites from the original X-Movies. Bishop, Blink, Warpath, and Sunspot were all introduced. And I might add, were 100% accurate to their comic book counter parts. I have no idea, if that has ever happened with ancillary characters in the X-Men Franchise of movies. Iceman and Kitty Pryde were 2 of the original X-Men who were leading that team. The fighting sequence in this was tremendous. The future Sentinels were so great and masterfully designed. After the initial fight and you can see that Kitty has the ability to send people back in time, the future groups of mutants are joined in China by Professor X, Magneto, Storm, and Wolverine. They go through the spiel about needing to go back in time and save the world, more specifically to stop Mystique from killing Trask and causing everything that is surrounding them. This movie at this point has a great narrative throughout it. That narrative is redemption. Everyone wants to redeem their past, in order to create a better future. A great narrative is one that can transcend multiple story lines and reveal itself in many different moments of the movie. We see it with Professor X, we see it with Beast, we see it with Magneto in the future, we see it with Mystique at the end of the movie, and we see it in Wolverine in every single scene in the movie. Redemption is a heavy sword through out this movie, and the post credits scene with Apocalypse shows that because in the comics he can travel through time, to redeem himself anytime he fails. The acting in this movie was flawless, especially by Peter Dinklage and Michael Fassbender. Both portray their characters perfectly. I loved the anguish on Magneto’s face as you can tell he has no remorse for the things he is doing because he knows it is for the betterment of his kind. Peter Dinklage has the same look on his face as Boliver Trask knows what he is doing is for the betterment of all humankind. There is a point where is first introduced where he is reading an excerpt from one of Professor X’s papers where he says that humans drove Neanderthals to extinction because they were weaker. At that moment he and Magneto become the perfect embodiment of one another and their paths were to cross no matter what timeline that they fell within. The final scene of this movie was the greatest, and as much as this movie was great, what Bryan Singer did was perfect. There are cameos be a few “X-Men” that wrap this movie up quite nicely with and basically say most of X2 and all of X3: Last Stand never happened. When they came onto the screen Oh Man it was so awesome. Jean, Scott, Rogue, and Beast all made their cameos. This movie wrapped up very nicely and from what I saw, the X-Men franchise is set for a very bright future! 10/10 Great! SEE THIS MOVIE!!! Well it’s finally here, the midnight release tonight of the epic follow up to X-Men: First Class. We have waited quite a while for Bryan Singer to come back to the helm and take the X-Men Movie Universe where it needs to go. We have gotten little tidbits of information about this movie bit by bit and then all of a sudden BOOM in your face! The Nerd Management crew are headed to yet another Midnight Release this year, and man have there been a ton. I am sure the review of DOFP will be up tonight right after we see the movie! There is supposed to be a stinger that leads into a movie I am looking forward to X-Men: Apocalypse. I just hope that it is different than what we were told about 6 to 8 months ago. Not even 10 years ago if someone were to find out someone collecting toys or read comic books they would be ridiculed and possible ostracized for it. “Only kids play with toys.” You may hear, or “Comics are for the immature.” A certain age group was assigned to these hobbies and anyone that deviated was labeled as weird or nerdy. Well guess what!? We grew up and we still read comics and collect toys, and thanks to the mainstreaming of the genre being a Nerd is cool. 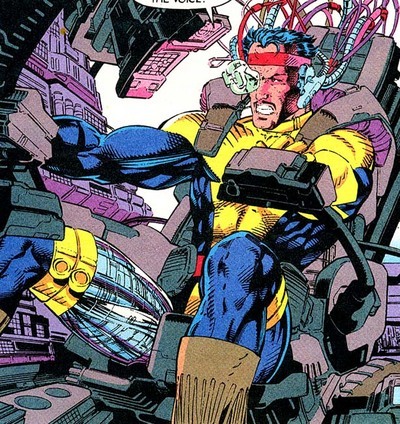 I remember growing up and going to the local IGA grocery store and picking up the latest X-Men and X-Force comics and reading them on the way home. I was so excited, I had been reading and collecting comics for my whole life it seemed at that point. I would always bug my mom to take me early but we had to wait until Friday, I always ran inside and threw a couple quarters in the sticker machine and made my way to the turnstile where they kept the comic books. One day I was flipping through the comics, and I caught a couple dirty looks from people. Maybe I was a little too old at the time to read comics? After that I was a little disheartened about comics for a while. I loved going to Indianapolis as a kid, I knew that if I saved up enough money I could get an action figure at Hills or KB Toys when we would go. My figures of choice were the X-Men/ X-Force line by Toy Biz and I always would go straight to the aisle they were in every time we hit KB Toys at the Washington Square Mall. I remember being 13 or 14 and walking around the mall with my mom, I found a 10$ bill on the floor of the mall and went straight to the store. I ran to the aisle and grabbed Four-Arm (X-Force Villain) and Sauron (Savage Land Villain) took them to the counter and slapped the 10$ down to the cashier. “Oh are these a gift for your young brother?” the cashier said to me. I was crushed, I took my figures and walked out of the store head as low as it could get. I continued throughout high school reading comics, collecting toys, and playing card games like Magic the Gathering. I didn’t really care much about how I or my friends were perceived, to us it was fun and a way to interact and express ourselves. Into college I took my collecting and while there I met more people who shared my love for Marvel Comics and Action Figures. It didn’t matter whether or not I had long boxes of comics in my room, or MOC Marvel Legends on my wall; both friends and girlfriends became second nature to the nerdiness that I was. I never felt out of place even though the world around me didn’t see my hobbies as acceptable for someone of my age. Somewhere along the lines all of this became socially OK, in fact it became mainstream. X-Men in 2000 kind of got the ball rolling with comics books coming to the forefront of pop culture. The success of the movie created an influx of comic book readers and then the mainstream of comic book fans became in. The influence of original comic book advocates influenced in other areas too. Collecting toys became less of a stigma and in fact toy collecting started to sky rocket. More and more people got into the collecting business. You saw action figure companies steer whole lines of toys towards collectors and that was sweet. This hobby of mine, sometimes this obsession of mine, has put a lot of things in perspective for me. I am in my early 30’s and no matter what in my life has changed this has remained. I have made more life long friends because of this, a group of guys that would do anything for each other. 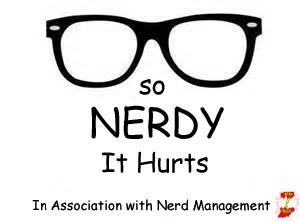 I am so thankful for my Nerdiness or I would have never met the Nerd Management Guys. I have a beautiful wife and an amazing son. Both of which love me for who I am. Being a Nerd is so much more now a days, and there is no stigma anymore to try to talk yourself out of, because I am proud of that fact. Along the years we have come very far as a subculture. From the depths of nerd to the heights of now what a Geek and Nerd actually stand for. To be in this culture and so integrated that you realize how it used to be compared to how it is now, is truly amazing. Knowing that 10 to 15 years ago you would be made fun of for the same things that people are spending more money than ever to have, is pretty surreal . My name is Mikel and I am a Toy Collecting Comic Book Reading Nerd for Life, and I am proud of that.